After visiting Village Tavern twice, I again got the chance to step foot inside its sophisticated dining space as it celebrated its first year anniversary. And as an American restaurant offering good ol' American comfort food, what better way to commemorate the occasion than to introduce new menu offerings to mark this important milestone. My first Village Tavern visit, left me craving for weeks. Everything we got a taste of was good and worth ordering again and again and again. That's why when I received an invitation to sample some of Village Tavern's new menu offerings in celebration of their first year anniversary, I was more than excited and confirmed right away, an unusual gesture from someone like me who's not that heavily into American cuisine. So before I babble some more, here are the dishes we got to try that evening. 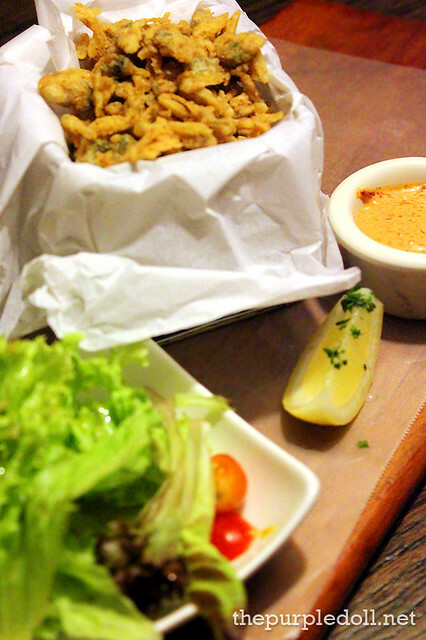 We started off with a serving of the Crispy Clams with Spicy Lemon Dip which had baby clams coated with batter and deep-fried to crispy pieces of niblets, and served with salad on the side. Although I find it easy to get taste fatigued from battered and deep-friend appetizers, I had myself continuously nibbling with this one. Every bite had nice combination of textures -- slightly crispy on the outside and chewy on the inside. The clam niblets were flavorful by themselves too, although the spicy lemon dip indeed balances out the savory and peppery notes, making every mouthful more enjoyable. 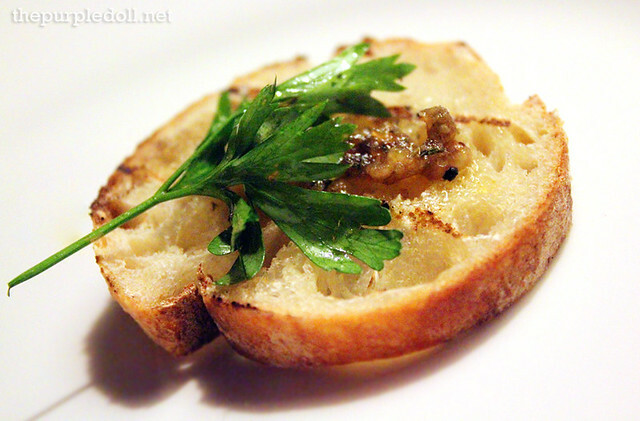 Another appetizer we had was the Roasted Bone Marrow served with salt, apple cider vinegar dip, parsley and sourdough bread. Unlike other bone marrow dishes I've had, this was unseasoned. We were told that the right away to enjoy this meal starter was to eat everything together -- bone marrow on bread with a little bit of every condiment. Eating everything together gives off subtle notes of fatty, salty, tangy and savory. However, the flavors weren't enough to whet my palate. 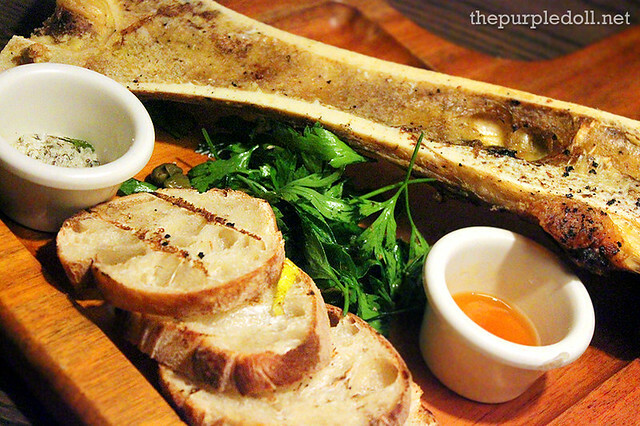 I think if the bone marrow itself was seasoned even a little bit, it would be more of my kind of bone marrow appetizer. 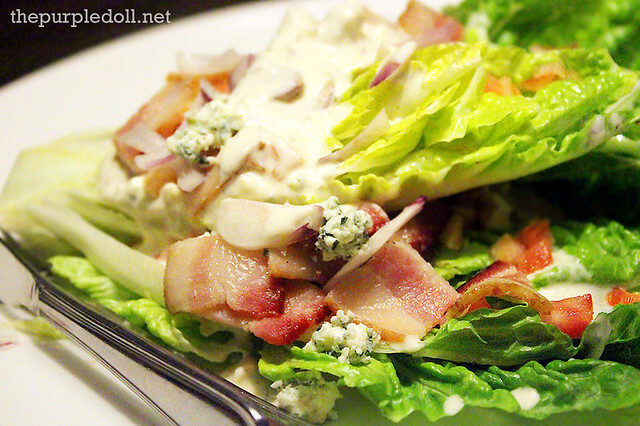 For salad, we had the Fully Loaded Romaine Heart which is a serving of beautiful freshly-cut Romaine lettuce with bacon slices, red onions, tomatoes, and topped with bleu cheese dressing. As a bleu cheese lover, this salad blew me away! The dressing which had bits of bleu cheese was so good with everything on the plate. Every forkful was a unison of highly enjoyable flavors -- fruity, salty and tangy with notes of rich, creamy distinct bleu cheese taste. It was so good, I wanted a whole serving for myself! 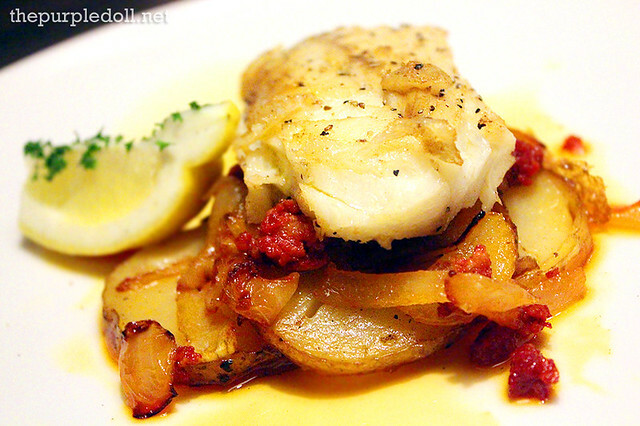 We then had a serving of Cod Fish -- pan-seared Atlantic cod cooked with garlic, caramelized onions and Spanish chorizo served on a bed of salt-roasted potato. I usually like flavors of seared fish items, and this was no exception. Flavor-wise, this dish had a nice balance of salty, savory and tangy that perfectly cuts through the palate. However, the fish itself was quite dry on the inside which I felt was such a waste. If only it was moist, this would've made my list of favorites from Village Tavern that night. As a lamb lover, I was happy we were getting a Lamb Rack dish, and done right for that matter. This rosemary-infused lamb was cooked to a perfect tender and succulence without much gamey note which it's infamously known for. 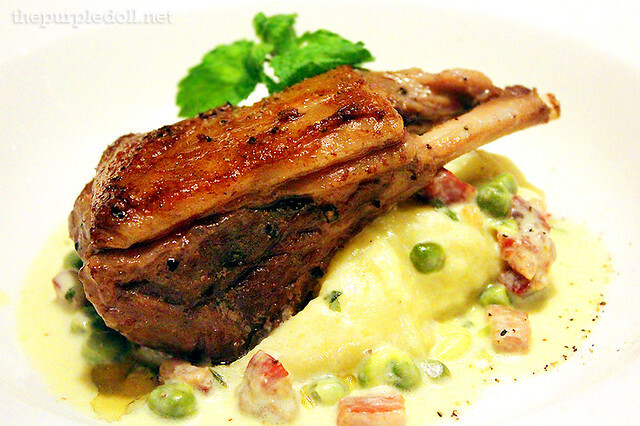 Served with smooth and creamy mashed potatoes, garden peas and mint, this was a good and enjoyable lamb rack item I'd consider having again on my next visit. Although a mainstay on the old menu, we still had the Tomahawk Steak which is one of the restaurant's prized aged, hand-cut and grilled meaty treats. While I have to admit, I'm more of a lamb eater than a beef lover, I can't deny that just the sight of this 35oz. of meaty succulence made me drool! Just look at that pink center... It's perfection! However, as much as we would love to have gotten that part, we were served the more cooked end part. It was still quite good, but not as less done as I would've wanted. To end the dinner on a sweet note, we had the Frozen Lime Souffle which is a light and airy lime-infused frozen souffle dessert with candied lime and walnut powder. 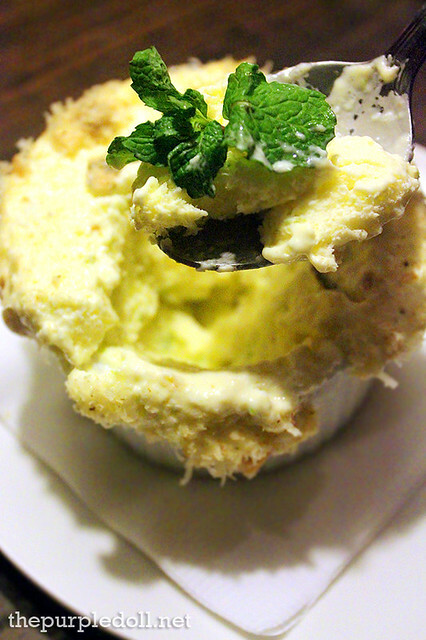 Unlike what we were expecting, the inside of the souffle had layers of cream and lime sorbet. 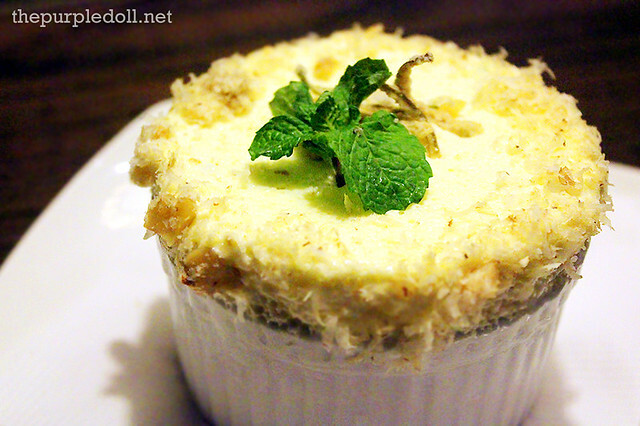 When eaten together with the pastry casing, it gives off a subtle zesty flavor and creaminess. However, everyone in our table thought this dessert might be better if only it had more tang. Nevertheless, it was pretty enjoyable. I for one, really liked the candied lime pieces. 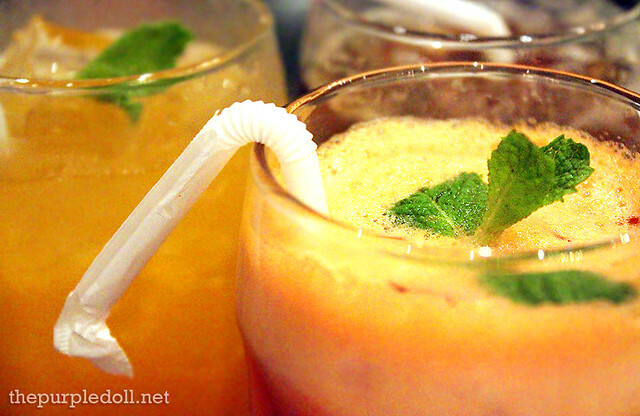 As for drinks, I had the Apple-Carrot Juice which I also ordered during my first visit. My friends on the other hand, had Dalandan Juice and Iced Coffee. Although American cuisine is not my top favorite, Village Tavern managed to give me an enjoyable experience with its new dishes. I can't say everything we had was perfect, but I definitely acquired 3 new items to include on my list of favorite Village Tavern dishes. And while price tag is quite hefty especially if you're a heavy eater like me, I think visiting a posh and sophisticated restaurant with good American comfort food under the wing of The Bistro Group can be worth the indulgence once in a while. Next month my will celebrate her birthday anshe want to eat at Village Tavern! because of their great and delicious food! Looks like a nice place to enjoy American dish. I might try to have my lunch or dinner here in the next few days. omg, a cholesterol laden meal! I think I will stick with the salad and the cod fish but everything looks yummy though. Out of these foods displayed here, I would rather prefer to eat the Lamb Rack. It is very rare to eat lamb meat. I happened to eat sheep's meat in my former place of work. It has no "tambok" (no-cholesterol). ahh that beef! now I am craving for steak! 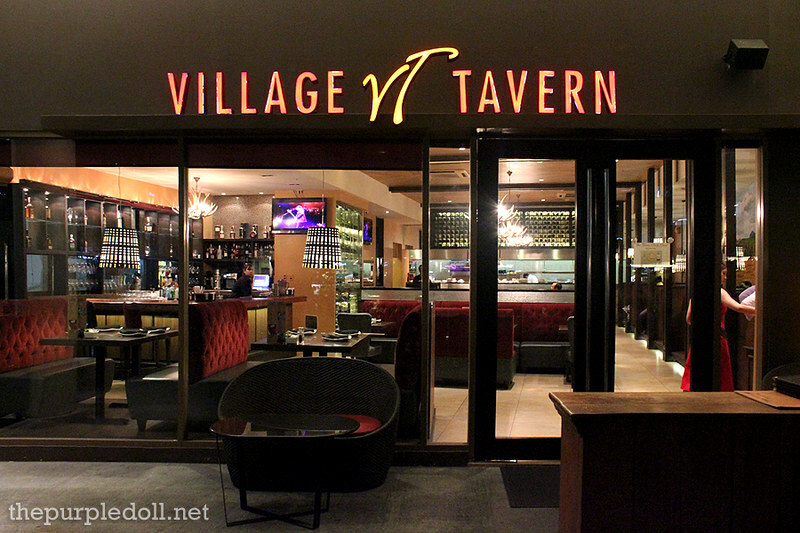 Will try Village Tavern soon! Reading your review and seeing those pictures salivate me!!! The lamb rack is to try for in that American resto. 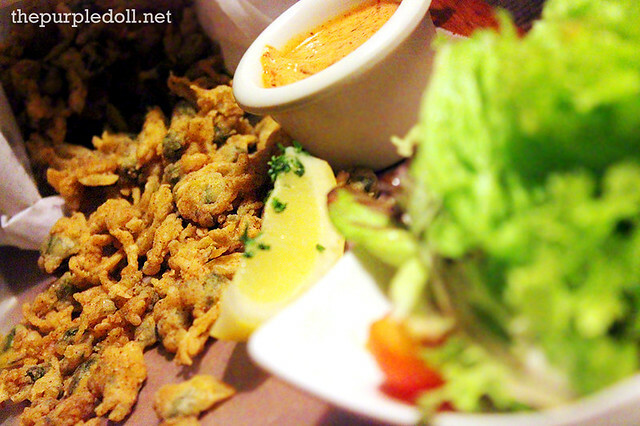 I will show this post to my hubby because he loves resto hopping for good cooked lamb recipe. The souffle looks delish too! I'm really not a fan of bone marrow servings. But the way you described VT's version made me think twice about trying it. I would also like to try the Lamb Rack. Although the hefty price is still something to consider. Your pictures got me miss eating out every Sunday and enjoy the food. Wow! Delicious food and a wonderful setting - perfect na perfect for a restaurant :) I wish I could taste all those scrumptious food. A real dining place to visit, the foods seems deli . If I have the needed bucks, I'll try siguro feasting on that Tomahawk 35oz. Look at that Tomahawk! Yum! But the price - ouch! But I bet it's worth it! :) The place looks very good! I stopped searching for more after seeing the Tomahawk..
Found the big catch.. Its look so yummy. I forgot what I read before that. With an overall value of 4/5, this is not bad. Yummy! I would love to eat at Village Tavern again! Whoa! Roasted bone marrow?! Anong lasa nyan? I can't really imagine it. Hehe. Para bang mantikilya na sunog? Hehe. Joke lang. Grabe. Ang ganda ng ambiance and ang ganda ng presyo! Hahaha! I wanna try the tomahawk!! sana meron pa silang ibang branch bukod sa taguig layo kasi ehh haha!